The Toshiba Asteion 4 mobile CT scanner serves as a quality, reliable solution for many hospitals, clinics, and private imaging centers. Offering optimal performance for a 4-slice scanner, the Toshiba Asteion 4 mobile CT is engineered to be flexible for improving speed and accuracy as well as patient comfort. The Toshiba Asteion 4 CT scanner is also the only 4-slice of its kind capable of tilted helical scanning. Furthermore, scanning with the Toshiba Asteion 4 CT has never been easier due to its highly efficient Guided Mode. This technology gives experienced users the possibility to scan even more efficiently and allows new users to get quickly get acquainted with the Asteion Multi 4 mobile CT scanner. 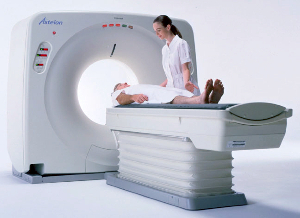 We recommend the Asteion 4 as a good quality, budget CT scanner. It provides high-quality images and its Guided Mode technology expedites the scanning process and helps ensure a complete, quality exam.